with a full capacity of 540 students. Application is accepted 4 times a year in January, April, July and October. appropriate school on controlling the visa status. The ratio of the students who stay illegally is 0 % for a long time. 3.The students who want to enter higher educational institutes entered almost 100%. 47 partner schools offer admission by MCA recommendation (as of Dec. 2011). higher students, 4 hour Japanese language lessons, and 2 hour English, Mathematics, and “Japan & the World” classes in the afternoon are available. The students have entered prestigious universities such as Waseda, Tokyo Institute of Technology, Hokkaido, Keio, Chuo, Hosei, Meiji, Nihon and so on. is offered to write a study plan. Tsukuba Graduate School, Waseda University Graduate School and so on. 6.The high percentage of students who pass the Japanese Language Proficiency Tests of N1 and N2. The special program is offered for the students who want to practice for the test. 7.Selective classes are offered on Fridays by the needs of students of Intermediate Ⅱ level or higher. is offered three times a week after the regular lessons. About 40 students per year were offered scholarships in 2009 academic year. 9.Tuition per year is 624,000 yen including facility fee, textbooks, and extracurricular activity fee. Tuition can be refundable by 3 month under certain circumstances. 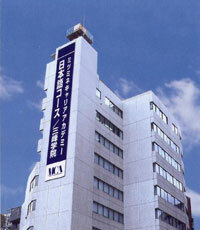 10.MCA is located in the center of Tokyo, Shinjuku Ward. The school is easily accessible by 5 minute walk from JR Okubo station, only 2 minute train ride from JR Shinjuku station. It is advantageous for a student to find a part time job. Information board of part time job is on the 4th floor. Wonderful view of Mt. Fuji from the students’ lounge on the 6th floor.